This standard provides guidance in the procurement of videoconferencing and telepresence equipment that has the required interoperability. Videoconferencing and telepresence are important technologies in establishing telehealth in New Zealand. Telehealth is the term for the use of information and communication technologies to deliver health care across a wide range of health settings and physical locations, such as between DHBs, integrated family health centres and long term care facilities. The Ministry of Health and the Health Information Standards Organisation recognised the need to specify standards to make sure the technologies and systems work well, are secure and talk to each other. Ministry of Health. 2014. 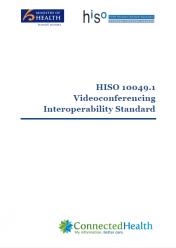 HISO 10049.1:2014 Videoconferencing Interoperability Standard. Wellington: Ministry of Health.